These by-laws were drawn up by Danny Schweers based on a meeting on October 28, 2014 with Gerry Meekins, Kathy Buckalew, Lynn Maniscalco, and Jeff Steen and a meeting on October 23, 2014 with Ken Francis, Gerry Meekins, Kathy Buckalew, Lynn Maniscalco, Jane Koester, and Jeff Steen. The Brandywine Photo Collective is an alliance of accomplished photographers in the Brandywine Valley who meet regularly for inspiration, education and fellowship. Shared knowledge and vision, and the mutual review and exhibition of new work, shall serve to explore and promote fine art photography. BPC is a non-profit arts and educational organization, and no income derived therefrom will accrue to the benefit of any private individual. The principal office of the corporation is 1035 Philadelphia Pike, Suite D, Wilmington, DE 19809. Membership is open to anyone seriously engaged in the pursuit of photography. New members must be recommended to the Officers by a current member, and may become members upon a portfolio presentation to, and approval by, the Officers, and payment of membership dues. Existing members continue to be members as long as they are current on their annual dues, unless their membership is revoked. Only members of the organization may participate in BPC activities unless otherwise approved by the Officers or the Membership, the decision of the Membership taking precendence. The amount of annual membership dues shall be set for each calendar year. The starting date of annual memberships shall be the 1st day of January. A motion to revoke a person’s membership may be made by a petition signed by one-third of the membership and presented to the Chair. A copy of the petition shall be sent by certified mail, return receipt requested, to the person subject to the proposed action. At the same time, members shall be notified that the proposed action will be decided at the next member meeting that is at least 15 days after the notification. The person affected may respond to the petition either before the meeting or at the meeting. The member shall have their membership revoked if a simple majority of members at the meeting so approve. Meetings of the BPC Membership may be set by previous membership meetings, may be called by a meeting of the Officers, or called upon written request of one-third of the members of the BPC. The Annual Meeting of the BPC shall be held on the third Thursday in January. Voting shall be limited to members in good standing. Guests invited by members are welcome to attend but may not vote. At least 5 days in advance of any BPC members meeting, the Secretary shall notify each member of the time and place of the meeting and the purpose for which it is to be called. Quorum shall consist of those present at the designated hour of the meeting. Roberts Rules of Order shall prevail at all meetings. Motions may be made at any meeting of the membership. The motion shall be binding if approved by a simple majority of the members present. Recalls, membership revocations, and amendments to these by-laws are governed by processes described elsewhere in these by-laws. Committees may be created, revised, and disbanded by motions approved at member meetings. Any member who volunteers may serve on a committee. Decisions of committees are subject to disapproval by the Officers or the Membership, the vote of the Membership taking precedence. Amendments to these by-laws may be proposed at any membership meeting and will take effect when approved by a simple majority in a vote taken of the entire membership by mail, email, or other means. Officers shall be members who have been in good standing for the 12 months preceding the date of annual meeting, and shall consist of a Chair, a Vice-Chair, a Secretary, a Treasurer, and the Immediate Past Chair. If the Immediate Past Chair is not available to serve, an At-Large Officer will be elected instead. Nominations shall be accepted every November from any member in good standing. Any BPC member may nominate themselves or another member to serve as an Officer. Only nominees willing to serve will be listed on the ballot. Ballots shall be distributed to all members on December 1 of each year and counted December 15, with the results promptly announced. Any candidate receiving a majority of the votes cast shall be elected. If no position’s nominee gets a majority of the votes cast, a run-off election shall be conducted in the following week between the two nominees who received the most votes for each position. Officers shall hold office for one year, from 12:00:01 a.m. on January 1 to midnight on December 31. Officers shall conduct the business of the Brandywine Photo Collective as commissioned by the membership and as specified elsewhere in these by-laws. The Chair shall conduct meetings of the Officers and of the membership, and approve which bills are to paid by the Treasurer. The Secretary shall take and publish minutes of meetings, and conduct correspondence. The Treasurer shall collect dues and fees, maintain the organization’s finances, pay bills that have been approved by the Chair, and report the financial status of the organization at least quarterly. The Vice-Chair shall fulfill the Chair’s duties in the Chair’s absence. Section D – Any vacancy shall be filled by appointment by the Officers to fulfill the remainder of the vacated term. A motion to recall an officer or other person from their position of responsibility may be made by a petition signed by one-third of the membership and presented to the Chair. A copy of the petition shall be sent by certified mail, return receipt requested, to the person subject to the proposed action. At the same time, the members shall be notified that the proposed action will be decided at the next member meeting that is at least 15 days after the notification. In that time, the person affected may respond to the petition either before the meeting or at the meeting. The member shall be removed from their position of responsibility if a simple majority of members at the meeting so approve. Regular meetings of the Officers shall be held at times and places to be fixed by the Officers and announced to the membership in a timely manner, such meetings to be open to all members. 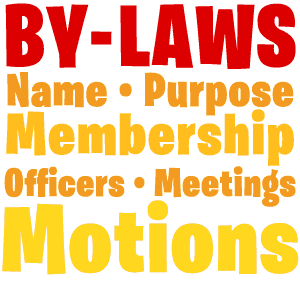 Special meetings of the Officers shall be called by motion of the Chair or at the request of any three Officers. Seven (7) day advance notice of the meeting and its purpose shall be sent to members. The presence of at least three members of the Officers shall constitute a quorum. All decisions by the Officers shall be made by a simple majority vote of those present.